per America's Educator, Noah Webster. to "paint" 3 dimensional portraits of George Washington. Manship produced the George Washington "Man of the Millennium" Book Festival televised by C-SPAN Television. Governor Gilmore appointed Manship to the Board of Visitors to Mount Vernon. over 30,000 miles to Washington sites all across America. When James Manship (aka'George Washington') visited our school in Richmond, Virginia, he made a terrific connection with the students. From our Kindergarten class to our high schoolers, he engaged the students with facts of history, humor, and an effort to communicate the kindness and character of our first president. The passion with which Mr. Manship conveys President George Washington is unique, in that, through his portrayal, one envisions not only the gentleman farmer, loving husband, and thoughtful family man that he was, but also the fiery defender of liberty that our nation depended on him to become. The research that Mr. Manship has invested in learning not only facts but also the spirit and heart of President Washington is evident in his presentation. Mr. Manship's portrayal duly honors this great man and stirred our desire to know more of President Washington. He made our day exciting and fun-and we learned in the process! George Washington became our "friend". This fine lady was a third grade teacher whose classroom was so inviting and interesting, I wanted to just take a seat, listen and learn. She now has been promoted to principal of the grade school, and still teaches two subjects, Art and Bible. She is a great encourager, and her students are blessed by their time with her teaching, and direction, to become better behaved and ever sweeter children. Educator and researcher brings history alive. I observed Mr. Manship produce the C-span historical book review on George Washington and coordinate a wide range of content experts. James is gifted at reaching ages 5 to 95 and is excellent at adapting to the interests of groups. He is invited to speak at corporate events, business associations, and conferences across America. James has appeared 5 times before the Virginia House of Delegates to receive a standing ovation on Washington's Birthday. He is respected for his knowledge on the Constitution, grand jury, Jefferson and Madison. I am aware that James is called upon by writers for his skills in researching and editing. James is recognized by more than 40 county and national newspapers. He has spoken in 33 county seats named for George Washington and 48 states. While I may have spoken All Across America, David Harrison has spoken at medical education conferences around the world, from Chicago, to Boston, to Oxford, to Geneva, to the country of Kazakstan. David Harrison is a master at Medical Education, while I have been described in 2005 by The Washington Times columnist John McCaslin as a "Master of American History" and in 2010 in The New York Times reporter Samuel Freedman spoke of Navy Veteran Manship "prepared a sort of concordance to the Preamble" of this Constitution, Mr. Harrison in his worldwide medical education focus is a man dedicated to saving lives. Thousands imitate Elvis but few try to pass as George Washington The former general, farmer and president because of the total commitment required. This fellow conveys the spirit and fervor of GW. The reviewer is "The Honorable", elected by his fellow sterling citizens as their public servant. Between elections, not just at election time, he goes door to door, up lots of townhouse steps, visiting citizens to hear their concerns and report face to face the work he is doing on their behalf. This man is a blessing to good government. Passion or energy, scholarship on Washington and this Constitution, military and civic leadership experience, and facial appearance many folks say looks like Washington, combine to create a memorable experience for folks in the audience, such that George Washington comes alive. George Washington LIVE! connects with the audience whether reading to children in a small group of "Revolutionary Readers", or in a class setting, an assembly for the entire school or college, or at a convention with hundreds, or an amphi-theater with thousands. Northern Virginia Daily newspaper did a nice "multi-media" interview of my early 2008 visit in my previous uniform, boots and cap to Woodstock, Virginia. The Northern Virginia Daily has posted the interview online. The final photo is priceless, a red, white and blue hug! The Capitol newspaper of Annapolis also had a nice slide show, but no longer maintains the link as active, however, I made a video of their slide show with my "narration" and posted to YouTube posted here on this website video section. In 1788, those wise words were penned by the President of the Constitution Convention, retired General George Washington, while waiting on the states to ratify the greatest accomplishment of his life, “this Constitution for the United States of America” - the Supreme statement of Statesmanship over Politics, a republic over a democracy, a light for Liberty all around the world, and one of the most Sacred documents in the History of Mankind. “Literary power and statesmanship were combined in George Washington, the greatest political leader of his time and also the greatest intellectual and moral force of the Revolutionary period. "Everybody knows Washington as a quiet member of the Virginia Assembly, of the two Continental Congresses, and of the Constitutional Convention. Statesmanship is Acting in the Role of a Leader. As an “Actor” on the American Stage, one must know that not all “Acts” are “pretend”, or fiction or drama, even though dramatic, and “performed” by the “Actor”; or even legislative “Acts”. In life are Acts of Courage, Acts of Kindness, Acts of Prayer, Acts of Grace, and Acts of God. The three dimensions of which I speak are Washington’s Public Life for America, his Private Live with family, and his Prayer Life with His Lord, from boyhood on, that as President he said was his “First duty”. Some public schools and institutions are skittish to hear about that third dimension, so I can share only two, or even one, still better than none. I can adjust to the desires of the organizers of whatever event may be planned. Craftsmanship is key. I craft my “act”, my keynote, to your unique needs at your annual meeting, convention, conference, seminar, banquet, parade or function. ---> Please contact me to learn when I may be available for your function, or for information on hundreds of companies, associations, conventions, parades, press conferences, book festivals, schools, colleges, civic groups, or churches where “GW” has spoken with Americans, “Acting” as a Leader on the American Stage. 'States' Manship has five times received as George Washington standing ovations in the House of Delegates in Richmond, in 2001 and four other times, most recently 2011. 'States' Manship was appointed by Governor James S. Gilmore to serve on the Mount Vernon Board of Visitors from 1998 to 2001. In 2008, 'States' Manship re-enacted the 225th "Birth of the Republic Day" resignation of General Washington to the Congress meeting in Annapolis, Maryland. In 2010 and 2012, Manship as Washington was pictured in The New York Times, and in 2003 and 2012 in LIFE Magazine, as well as many other publications in other years. 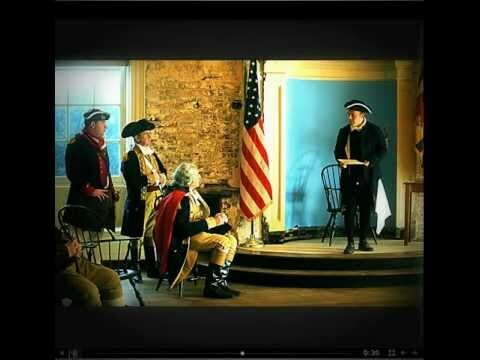 Live His Story, Live History... See and hear J.R. 'States' Manship as George Washington LIVE! 1998 Appointed to Mount Vernon Board of Visitors by Governor Gilmore. 1999 Did over 100 GW "Dinner Theater" performances to over 5000 high school students visiting Washington on tours. 2000 Primary actor to dramatize several books presented at the all day George Washington "Man of the Millennium" Book Festival televised nationwide by C-SPAN TV. 2000 As GW, traveled over 30,000 miles in 5 months during election season, received over 30 news articles and photos. 2001 First of five Standing Ovations by Virginia House of Delegates for work on Washington's Birthday. 2003 "Revolutionary Christmas" playwright, invited to be the GW actor in that play at Regent University Theater. 2004 Navy Chaplains Convention Keynote Speaker on First Navy Flag, the Appeal to Heaven Flag, Liberty Tree Flag. 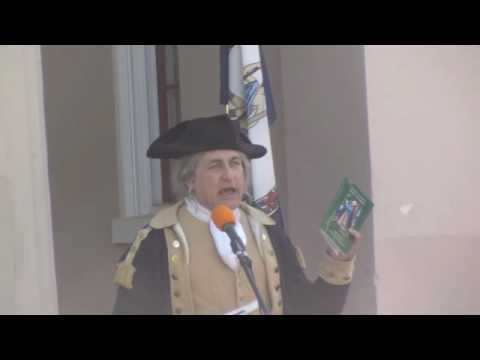 2005 First book on George Washington "Prayer Warrior Washington"
2010 Third book "Second to None: America's Washington"
2014 "Lead Off Speaker" on Independence Day at DAR - Constitution Hall as part of Celebrate America! 2014 Leading actor for American University student film, "When America Met China". I have worked in many venues, from kindergarten classrooms to high school assemblies to law school auditoriums, from outdoor amphi-theaters, to university auditoriums and historic hotel theater stages, to church pulpits. I have a "command voice", and also have sung solos, duets, and small groups as one of the "Founding Fathers and Sons of Liberty", and solo or in groups at public events, so can adapt to many situations. See the Hanover Courthouse video (end of the 10 minute video) to see how I lead the Citizens to sing in unison! In some settings, I create the scenes by "wordsmanship" with the narrative of my presentation. Depending on your needs and time constraints, I can speak for 5 to 15 to 50 minutes, to 5 hours or 5 days, though no one as yet has asked for the latter two, or as I write below in the typical gig duration, 9 to 90 minutes. I can do a one hour long, one day long or even a week long in-depth instruction on "this Constitution for the United States of America", the greatest document of statesmanship in the history of Man, that has been copied in whole or in part by dozens if not over one hundred nations in the world. While imitation is the most sincere form of flattery, it is also the sign of the influence of the American system across continents and centuries, a system of statesmanship that has transformed space and time. Also, I can do a one day or week long travel around Virginia and the Mid-Atlantic training teachers in making History come alive by being a "Living Historian", both for students in the classroom and to benefit fellow citizens in your community. I have done many "dinner theater" type performances, and been the keynote speaker at fundraiser banquets. INFLUENCE: Actor Hal Holbrook as "Mark Twain Tonight", I studied and read a biography about Holbrook that helped me understand the role of a re-enactor. As a boy of ten in 1963, I was encouraged by the publisher of The Atlanta Constitution, Pulitzer prize winner Ralph McGill, to read this Constitution for the United States of America. At high school debate tournaments, I competed in Dramatic Reading and Extemporaneous Speaking events. In 1993, I completed an intense one page study of the Preamble to this Constitution that was described by The New York Times on 6 November 2010 as the "Concordance to the Preamble". George Washington was the "Caped Crusader for this Constitution" and I seek to continue his crusade. *Lincoln is my Second in Command at Yorktown, who I decided would accept the surrender from the British, General Benjamin Lincoln, the general on the white horse in that famous painting of the Surrender of the British at Yorktown! When Emcee, program schedule, and phonetic spelling for people to be mentioned.